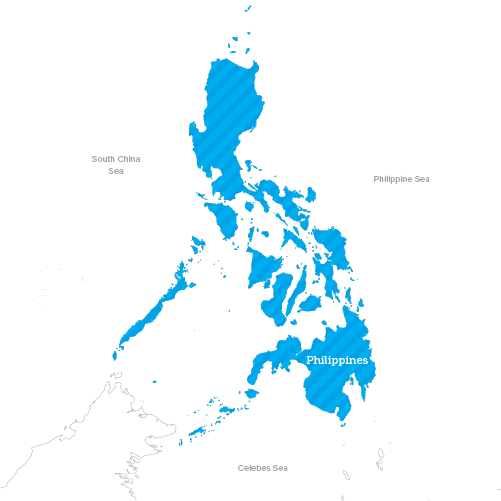 The Philippines is an archipelago of 7,641 islands in the western Pacific Ocean. Its location along the typhoon belt and Pacific “Ring of Fire” (home to 90% of the world’s earthquakes) put the Philippines at high risk for natural disasters and such climate-sensitive diseases as dengue, malaria, diarrhea, and cholera. When Super Typhoon Haiyan hit the Philippines in November 2013, International Medical Corps was on the ground within 24 hours. The Super Typhoon left widespread devastation affecting an estimated 16 million people. Our teams provided a comprehensive emergency response, delivering 14,625 health consultations in the first six weeks alone. Our First Responders were able to reach remote communities cut off from healthcare and basic services by rapidly implementing a network of mobile medical units. More recently, International Medical Corps responded to Typhoon Hagupit in December 2014, and to Typhoon Mangkhut in September 2018. Today, International Medical Corps is addressing critical needs in the Philippines with a long-term approach to rebuilding affected communities and helping them become their own best First Responders. We have established programs in the areas of nutrition, health, mental health, and water, sanitation, and hygiene. On September 14, 2018, Typhoon Mangkhut slammed into northeast Luzon—the Philippines’ largest and most populated island—reportedly producing waves reaching almost 30 feet high, causing excessive flooding, resulting in more than 40 landslides, killing hundreds of people and displacing hundreds of thousands more. We were on the ground within 24 hours of Typhoon Haiyan in 2013, which left widespread devastation affecting an estimated 16 million people. Our teams provided a comprehensive emergency response, delivering 14,625 health consultations in the first six weeks alone.